Film School Rejects recently posted a list of the best — and worst — movie collaborations between directors and their spouses. It seems those capricious movie gods have decreed that for every Oscar-winning gem like Fargo (Joel Coen directs Frances McDormand) there must be a farrago like Guy Ritchie’s Swept Away, starring his then-wife Madonna. No-one, though, could accuse Claude Chabrol of stunt casting or undue uxorial influence in making his second wife Stéphane Audran the leading lady in many of his films, including Le Boucher, La Rupture, and Juste avant la nuit. The veteran French director, who died on 12 September 2010, was one of the founding members of the Nouvelle Vague, though he wasn’t regarded as an innovator in the same way that François Truffaut and Jean-Luc Godard were. Chabrol was also known as “the French Hitchcock”, an epithet that was probably unavoidable for a man who worked so often and so effectively in the genre of suspense. Like Hitchcock, Chabrol’s output was prolific, from 1958’s Le Beau Serge, to Bellamy (2009) starring Gérard Depardieu. But if you relish the slick set pieces that distinguish some of Hitch’s best-known films — the Mount Rushmore sequence in North by Northest, Kim Novak’s fatal plunge in Vertigo, or the Statue of Liberty climax to Saboteur — you might find Chabrol a bit low-key. As far as I know, none of his movies feature a struggle to the death on the Eiffel Tower or any other Parisian landmarks. What I love about Chabrol is that he wasn’t a studio-bound director — he was a master at capturing the look, the sound and the feel of provincial France, in his stories of betrayal, sexual transgression and violent death. The masterful opening scene of Que La Bête Meure (1969) shows a boy walking through a peaceful Breton town just moments before he’s mowed down in a fatal hit-and-run incident. 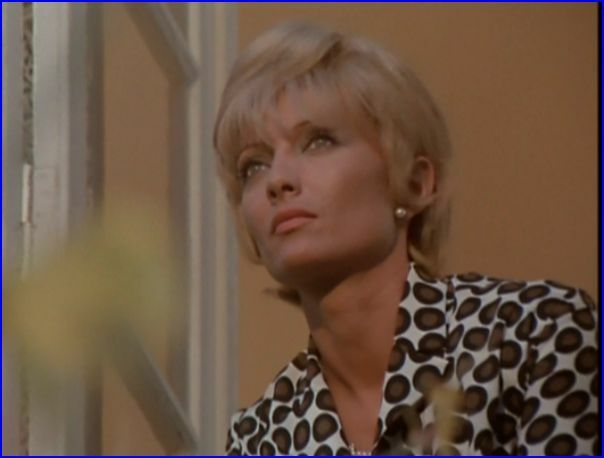 The lovely village of Trémolat in the Dordogne is as central to the Le Boucher (1970) as Audran’s cool blonde headmistress, who brings out the Cro-Magnon man in Popaul (Jean Yanne) – with fatal consequences. Their bizarre mating ritual does feature some classic Hitchcockian black humour, including a moment when the lovestruck butcher turns up in the classroom to present her not with a fragrant bouquet, but a neatly wrapped leg of lamb. If things had been different, you could imagine the Audran of the 50s and 60s appearing opposite Cary Grant or James Stewart in To Catch a Thief or Rear Window. She certainly had the looks and the screen presence to rival any of Hitch’s leading ladies of the period. But though Chabrol trades on her capacity for leading men astray in films like Les Biches, La Femme Infidèle and Les Noces Rouges, he doesn’t objectify the women in his films to the same degree that Hitchcock does. When I first saw Chabrol’s L’Enfer (1994) I had no idea that he was working from a screenplay abandoned by another great French director, Henri-Georges Clouzot, 30 years earlier. It’s not his best work, but François Cluzet and Emmanuelle Béart bring a physical intensity to their deteriorating relationship that, by the end, is almost frightening to watch. As jealous husband Paul, the increasingly unhinged Cluzet looks like a cross between Robert De Niro and Dustin Hoffman, while Béart’s performance suggests an accomplished character actress trapped inside the body of a temptress. Chabrol, who also notched up more than 50 writing credits, adapted novels by leading crime writers including Georges Simenon (Betty) and Patricia Highsmith (Le cri du hibou). But it is his 1995 Ruth Rendell adaptation, La Cérémonie, that best exemplifies his ability to turn class tension and domestic unease into unimaginable carnage. Isabelle Huppert and Sandrine Bonnaire, play the unlikely partners in crime who wreak revenge on the bourgeois family of Jacqueline Bisset and Jean-Pierre Cassel. The climax of the film shows the unsuspecting family enjoying a cosy evening watching Mozart’s Don Giovanni on TV, while two very disturbed women indulge in some Clockwork Orange-style mayhem. It’s both horrifying and oddly comic. If you only ever watch one Chabrol film, make it this one.